*I do offer vegan recipes on my website www.LindaLaRue.com's Make Healthy A Lifestyle digital bi-monthly magazine. I am not a vegan, as I eat fish and occasionally chicken, but no meat. I find the percentages of childhood obesity for kids who eat vegan versus a diet eating animal protein compelling. 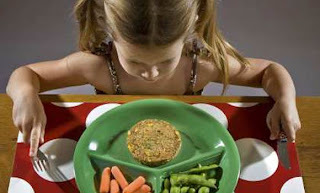 Parents of non-meat-eating children need to make sure the youngsters eat a balanced diet. Studies show that, properly done, such eating is fine, and can provide benefits. Toddlers who refuse to eat furry animals; teenagers who suddenly hate everything their parents cook; children of vegetarian parents. Whether it's your choice or theirs, raising a vegetarian kid can be a challenge. Growing in numbers. It's hard to pin down just how many people are eating vegetarian diets. For one thing, definitions vary. Some people call themselves vegetarian even if they occasionally eat fish or chicken, while others have stricter views. For another, statistics vary depending on how surveys are done. The Centers for Disease Control and Prevention has estimated that about 1.5% of adults followed a vegetarian diet in 2007, about the same number as in 2002. But those numbers may be lowballs because the poll questions catch people who use vegetarianism only to address health, not ideological, concerns, says Reed Mangels, a registered dietitian in Amherst, Mass., and one of the authors of the American Dietetic Assn. report. Polls by the Vegetarian Resource Group find that among adults, vegetarianism has become slowly and steadily more popular in the last 15 years, says Mangels, who is a nutrition advisor for the advocacy organization. In 1994, the group estimated that 1% of American adults were true vegetarians, eating diets free of meat, fish and seafood. Today, about 3% of American adults (between 6 million and 8 million people) avoid those foods, according to the vegetarian group's 2009 poll of more than 2,000 people. The stats for children also differ depending on source. A recent CDC poll of about 9,000 parents and guardians found that 367,000 kids under the age of 18 -- or about 1 in 200 -- are vegetarian. Again, Mangels says the true rates may be higher. A 2005 Vegetarian Resource Group poll of more than 1,200 young people estimated that 3% of 8- to 18-year-olds (about 1.5 million kids) were vegetarian and 1% were vegan. There are also a growing number of people -- kids included -- who still eat meat but are eating less of it and choosing more typical vegetarian foods instead. Sales of processed vegetarian products, such as soy milk, soy yogurt and vegetarian breakfast sausages, totaled about $1.4 billion in 2008, according to the market research firm Mintel, up 15% from 2003. Close to one-third of adults say they ate a soy-based meat substitute in the last year, Mintel reports. These days, even Burger King offers veggie burgers. Meat's pitfalls. At least for adults, there is accumulating evidence that a traditional meat-and-potatoes diet is not the healthiest way to eat. For example, a March study of more than 500,000 people ages 50 to 71 found that adults who ate the most red meat were more likely to die over a 10-year period than were those who ate the least, mostly due to extra cases of cardiovascular disease and cancer. The biggest meat-eaters in the study consumed the equivalent of about a quarter-pound burger or small steak each day, while people who ate the least meat took in about 15% of that amount. The authors concluded that 11% of deaths in men and 16% of deaths in women could have been prevented if everyone in the study ate the smallest amount of red meat. Similar results have come from research on Seventh-day Adventists, a Christian denomination that advocates a healthy lifestyle. Most Seventh-day Adventists exercise regularly and avoid tobacco and alcohol, but those who avoid meat (about half of the population) have lower risks of heart disease, diabetes, arthritis and some cancers than the meat-eaters do. Health benefits may come as much from what vegetarians do eat as from what they don't. Studies show that vegetarians not only consume less artery-clogging saturated fat and cholesterol but also get more of certain antioxidants and vitamins, such as potassium, magnesium and vitamin C. They eat up to twice as much heart-healthy fiber, from fruit, vegetables and whole grains. They have lower cholesterol levels and blood pressure readings. And they tend to be leaner than meat-eaters. In a 2003 study of nearly 38,000 people in the United Kingdom, vegans weighed in at about two points lower on the Body Mass Index scale than meat-eaters did, while vegetarians and fish-eaters fell between the two extremes. Keeping extra weight off may be one way to avoid a number of chronic diseases, including Type 2 diabetes and heart disease. For young vegetarians, health consequences are less straightforward. Few researchers have focused specifically on vegetarian kids, and outcomes are hard to measure because chronic diseases just aren't common in young people. Spotty and outdated information has left an alarming impression on many parents. Some studies in the 1980s worried people about dietary deficiencies that can result from vegetarianism, Renda says. They suggested that kids weren't getting enough of nutrients such as vitamin B12 or calcium to grow well. But this research focused on extremely restrictive diets, such as veganism or macrobiotic diets. Doctors at the time were less informed about how to counsel their patients who chose to feed their families vegetarian meals. Meat substitutes and fortified foods were also less common. "As doctors, we weren't great about telling people they might need to take supplements, and we saw kids with nutritional deficiencies," Renda says. "Now there are a lot of articles focusing on kids, saying they can be pretty normal." Other research suggests that if pregnant vegetarians make sure to eat a well-balanced diet, babies are no more likely to be born early, small or with complications. As they grow from babies to preschoolers, vegetarian kids rival their peers in size. A British study in the late 1980s, for example, found that vegan kids raised by well-informed parents were all within the normal range of height, weight and head circumference. An American study around the same time found that vegetarian kids all hovered near the 50th percentile in those measurements. When they reach adulthood, lifelong vegetarians are similar in size and body mass index to people who become vegetarian later in life. "As long as they are receiving enough of the key nutrients and enough calories," says Laurie Dunham, a registered dietitian at the Cincinnati Children's Hospital Medical Center in Ohio, "they can grow perfectly well and measure up to their non-vegetarian counterparts just fine." Beyond doing no harm, vegetarianism may also help kids, research suggests. For one thing, cutting down on meat early in life might be one way to counter the rising rates of obesity, along with the chronic diseases associated with it. Some evidence suggests that vegetarian kids are slimmer than their meat-eating peers and that teenagers are less likely to be overweight or obese if they don't eat meat. Studies also show that vegetarian teens eat fewer sweets and junk food and get more fruits, vegetables and fiber. In a 2002 study of more than 4,500 teenagers, University of Minnesota researchers found that 70% of vegetarian teens were within the guidelines for total fat intake, compared with 48% of non-vegetarians. And 39% of the vegetarians ate five or more daily servings of fruits and vegetables, compared with 28% of meat-eaters. "Just by their diet alone, vegetarian children tend to be leaner," Renda says. "That helps them as adults because they're not getting the double whammy of being overweight as kids already." Food habits also form early, which means that learning to like a variety of grains and vegetables as a kid is easier than learning to like them as adults. Despite the endorsements, there are some serious pitfalls when kids stop eating meat. That's especially true when the idea is new to parents, some of whom may have never heard of Tofurky or soy meatballs. Just because a meal is technically vegetarian doesn't guarantee that it's good for you, says Ruth Frenchman, a registered dietitian in Burbank, and spokesperson for the American Dietetic Assn. "I've had many vegetarian clients who didn't eat vegetables," Frenchman says. "If they're just eating chips and soda, they're vegetarian, but they're not healthy." Read the accompanying LA Times story about the important nutrients for a vegan child, and check out the articles on conflict with kids and special issues pertaining to vegetarian teens @http://www.latimes.com/features/health/la-he-vegetarian-kids-tips9-2009nov09,0,7319554.story.